"Central Park" on the ship. "Longer than New York City's famed Chrysler building, the Allure of the Seas is so big, that it has "neighborhoods" like Central Park, Royal Promenade and Boardwalk. Like a city at sea, each "neighborhood" has its own unique "personality" along with numerous attractions that everyone onboard can enjoy..."
"After we ate at the Chops Grille the next night, with its Chicago stockyards theme, and another day at Sorrento’s pizzeria, with photos of Manhattan, I began to see that the Allure is an urban ship, a celebration of cities, a 24-hour dream of lights and movement and the power of being in the center." The cruise ship arguably represents the ultimate glorification of the public realm at the expense of the private, with living quarters, for most passengers, cramped in comparison to those of the cheapest hotel lodgings on land. It is also the ultimate pedestrian-centric environment, reliant entirely on foot transportation. And yet, the ship is a highly desirable "getaway" for Americans from across the country. In spite of these typically urban, and traditionalist urban, qualities, the architect best known for deriving inspiration from the design of large passenger vessels is none other than Le Corbusier, who was attracted by the streamlined nautical aesthetic of ships as well as their implications for urbanism. The Unité d'Habitation was itself conceived in part as a self-contained, permanently-anchored ocean liner equipped with both necessities and amenities, thus taking the lesson of the big ship quite literally -- perhaps too literally. The Unité mimicked the ocean liner's isolation even when there was no need to do so, and shrunk units even in the absence of spatial constraints. Are there other, more pro-urban, lessons to be learned from the "high density design and rigorous servicing discipline" of ships, as Stewart Brand asked in How Buildings Learn? I'll leave that one hanging. *The since-demolished Kowloon Walled City was reported to have had over 3,000,000 per square mile in the late 1980s – essentially representing four Dharavis stacked on top of one another. One thing examples like this show is that it is not "density" per se that people don't like. In fact, people tend to like "density," for the same reason that they want to go to the popular nightclub rather than the unpopular one. It's more fun with more people. The problems of "density" are rather things like sanitation (not a problem today but it was in the past), lack of appealing outdoor space (New York and most any other 19th Century Hypertrophic City), and of course the excessively large roadways dominated by automobile traffic. Once you solve these problems -- in this case on a ship, which is a 100% pedestrian place -- people's concerns about "density" disappear and in fact they are happy with colossally high densities. This is one reason why I am not 100% opposed to the Corbusier high-rise/parks combo. Unfortunately, instead of highrises/parks, in short an appealing interior environment combined with an appealing exterior environment, what we tend to get is highrises combined with superhighways, parkings lots and "green space," a totally sterile and hostile outdoor environment. In other words, we could do a lot of different things than what we have done. There's an interesting history of "multi-use highrises" in Hong Kong, where the building becomes a sort of vertical village with shops, restaurants, etc. scattered throughout. I would look at the Kowloon "Mansions" such as the infamous Chungking Mansions or neighboring Mirador Mansions. They are slummy but also a lot of fun. With all that said, however, I'm not sure that any sort of highrise development really presents a meaningful improvement on the Traditional City, which can achieve densities of 100,000 people per square mile while providing a wonderful, exciting environment. 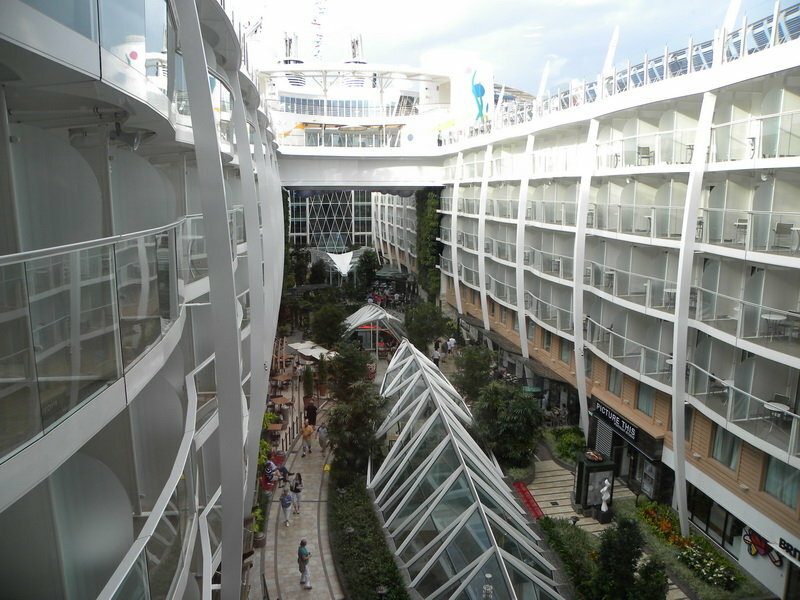 I might also note that the Allure of the Seas also presents something like a high-density Traditional City environment. The "Central Park" area you show is surrounded by walls six stories high, which is right in line with typical Traditional City dimensions. I would say most people don't mind the density on-board the ship for two reasons: most passengers are similar to one another and the ocean does a good job in keeping the riffraff out. Neither of these benefits are available in the typical urban area. Anonymous: the New York Times article actually emphasizes the polyglot composition of the ship's passengers, which seemed to rival any assortment you'd find on the streets of Manhattan. Of course, there is probably less economic diversity, but the cruise is not for the mega-rich only.